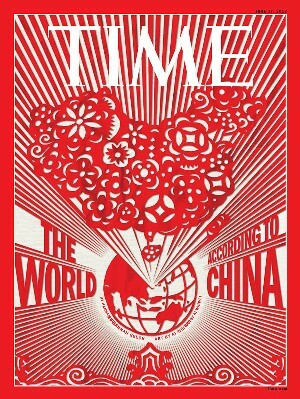 If you think satire iconic master Ai Weiwei's Time Magazine cover is a pretty image, you totally miss his point. Watch the video where he explains its meaning. When I first looked at the Time cover by Ai Weiwei, I felt repugnant, as it is symbolic of Communist red dominance and the conquest of China mainland. Only after I listened to the explanation of the paper cut art work, then, I can fully appreciate the mind and soul which went into it. While the ROC flag means our own blood in gaining liberty from the Qing invaders, the PRC five star flag means the annihilation of the Nationalists and massive persecution of people. So when I saw the big red menacing cover, I felt uncomfortable like when I traveled to China's State Department with Mao's writing like a brute bandit, it literally sickened me and dragged me down my spirit. But according to Mr Ai's explanation, the gaudy flower vase money symbol means that Chinese emphasize money out of proportion, as flowers mean fortune. They are drunk in their belief of racing to be on the globe with glitz, but with no value. The whole thing is like a paper cut, not solid but hollow, a cut out mode of display. As someone born in Taiwan, I can't forget those trembling years when we suffered under Mao's constant brandishing to blood wash Taiwan by crossing the Taiwan Strait. Communists always tout their success in liberating China. Their common theme is that they are victorious in removing the corrupt regime of nationalists. Ai Weiwei ridicules that Chinese society under Communist control has run amok, with valueless self importance, which only amounts to for a show of display, nothing solid, but fragile and hollowed out, no emotion. It is of great satire art work, kind of innovative. He is still awake. But all this is to cover up how they didn't fight against fascists, yet they enjoy the hard work of intense 14 years of resistance war efforts against the world's aggressive and invasive powers, mainly, Japan, Russia as the nearby neighbors. We had America as our ally, but we had to fight on our own from 1931 to 1941, when America joined the allies. Communist society is empty because after many years of propaganda, they are so lost that their pursuit of wealth is number 1, and they have no other work credit to be proud of, but just an empty vacant paper cut flower image. Ai Weiwei did a good job in delivering his message and evaluation of the Communist current state of mind.